Consider what happens in the cold open — a common name for the action that takes place before opening credits. Enterprise’s first officer, referred to simply as “Number One,” (Rebecca Romijn) beams aboard Discovery. The officer is there to brief Captain Christopher Pike (Anson Mount) on the status of his malfunctioning ship. Number One has also been doing some unauthorized digging into the murder charges leveled against Mr. Spock. Presumably the sensitive nature of this information is the reason for her visit, as all other news she shares with the captain could have been handled via subspace communications. She physically gives Pike a PADD containing data that will allow Discovery to pursue Spock’s shuttle. That would normally be just about enough for a teaser. But next we move to Engineering Test Bay Alpha, where Lt. Paul Stamets and Ensign Sylvia Tilly (Anthony Rapp and Mary Wiseman) have quarantined the organism previously removed from the ensign. The organism has grown to resemble an undulating six foot cocoon. Without warning, the mass reaches for Tilly’s hand, forming its own human-like digits. Tilly recoils in shock. Again, we could cut to opening credits here, but the story setups continue. We move to a command staff briefing where we are reminded that not only is Discovery attempting to solve the mystery of the red signals, it has now taken on the secondary challenge of determining the purpose of the so-called Red Angel. During the briefing, Enterprise’s Commander Nhan (Rachael Ancheril) appears, as if from nowhere, saying she has rejoined the crew of Discovery. Also, First Officer Saru (Doug Jones) is not feeling well. One can guess that Saru’s condition will continue to play a part in the episode. But wait. There’s more. Without warning, Discovery is violently plucked out of warp by a giant glowing red sphere. Not to be confused with the red signals. The starship is trapped. Okay, now we cut to opening credits. If that seems like a lot, it is. With a story by Jordan Nardino, Gretchen J. Berg and and Aaron Harberts, and a teleplay by Alan McElroy and Andrew Colville, “An Obol for Charon” is so solidly packed, it’s hard to absorb everything in a single viewing. This has the unintended consequence of making an important story taking place in the test bay feel more like a throwaway subplot. Tilly’s excruciating experience feels like a concept grafted onto another script. It appears to have little to no connection with everything else taking place on the ship. The entry of Commander Jett Reno (Tig Notaro) does not change that vibe. Her sudden appearance and subsequent sparing with Stamets feels forced. Her jabs seem a bit hollow and her “trippy” encounter with Stamets is awkward, It’s as if the writers felt she needed to be there to add something to the scene. But I still can’t tell what that “something” was supposed to be. We simply end up with one more person in this rambling series of events. When Commander Michael Burnham (Sonequa Martin-Green) attempts to enter the lab, she almost seems like part of a different universe. None of this should be the case. Tilly is just collateral damage in an episode overflowing with plot. Think about that. Tilly is consumed by an interdimensional organism, has a hole drilled in her head, and then vanishes. And yet, that is not the main thrust of this episode. Truth be told, the connection between the stories of Saru and the sphere would be more than enough for a single episode of this show. We should see the crew constantly coming up with clever plans that almost allow them to break free from the sphere — but in ways not too reminiscent of the TOS episode “The Corbomite Maneuver.” It would also have been nice to get more of a sense of connection between Saru and the sphere, since their fates are so intertwined. That would make the divergence of each resolution all the more poignant. Speaking of Saru, did I mention that in the process of his not dying, we pick up a new story thread to track? Now that Saru realizes his people are living (and possibly dying) under a false assumption, I’m sure the commander will attempt to communicate with his homeworld. It’s time for “Star Trek: Discovery” to stop picking up new plot lines and mysteries like it was a giant katamari rolling through Agatha Christie’s library. We need to start getting some answers. The story is making a habit of having characters simply appear in a scene. First there was Tilly’s “ghost,” May Ahern and now, in this episode, Commander Nhan and, to a large extent, Commander Jett Reno. We get one more reminder that there is no place for holograms on Enterprise. It makes me begin to wonder just how extensive the “repair work” will be while the ship is in spacedock. The writers are too dependent upon reference to 20th century Earth music. Last season Stamets said that his uncle played in a Beatles cover band. In this episode Reno mentions Prince and we find out that Tilly’s favorite song is “Space Oddity” by David Bowie. Not only would that song be more than 280 years old, but it’s hard to believe that both Tilly and Stamets know the lyrics. The show needs more original songs, like “Beyond Antares” and references to Kasseelian opera. With “Brother,” we find ourselves off on a whole new set of adventures with the crew of U.S.S. Discovery. And there are a few “new” characters along for the ride as well. How does this premiere compare to last year’s opener, “The Vulcan Hello”? This episode appears to go by faster, even though it is a whopping 61 minutes, compared to the 43 minute run time of “Hello.” It is brighter, wittier and more accessible. It lights up every inch of the new cinematic 2:35 : 1 aspect ratio of the frame. But it does rely on a series of standard “sequel” setups that it has to work its way through. One of the fastest ways to get a sequel rolling is to shake up the lives of the characters in the story. In some cases, that means the people we saw together are now far apart and someone has to “put the band back together.” Admiral Kirk had this task in “Star Trek: The Motion Picture.” He needed to reunite with McCoy, Spock and Enterprise itself. Another way to jumpstart the story is by having things not turn out as we assumed they would. For instance, at the beginning of “Ghostbusters II,” the guys are not living the life of fame and fortune we assumed they would. They find themselves performing at children’s birthday parties. Or what about Sarah Connor? After defeating the Terminator, she finds herself in a mental institution, believed to be insane. And wait, we thought Luke and friends defeated the evil empire in the original “Star Wars.” Sorry. “The Empire Strikes Back” nixes that assumption. In the season two premiere of “Star Trek: Discovery,” all these challenges, and more, are brought into play. And it is the job of “Brother” to set all the wheels in motion. For starters, Dr. Paul Stamets (Anthony Rapp) has decided to leave Discovery for a position at the Vulcan Science Academy. The ship is simply too full of painful memories. “Hugh is everywhere I look, Tilly,” Stamets tells Ensign Sylvia Tilly (Mary Wiseman). “How much am I supposed to take?” Then there is the issue of Spock, who, we learn, is not on board Enterprise. He has taken an extended leave. Pike is sad. Burnham is sad. Oh, no! Someone needs to get the band back together! Speaking of our favorite Vulcan, the backstory about his childhood encounters with Michael Burnham (Sonequa Martin-Green) paints a picture of less-than-ideal sibling relationships within the house of Sarek and Amanda (James Frain, Mia Kirshner). Although we already knew that this was not the most fun-loving of households, the chasm between Burnham and her foster brother appears to be extremely wide. That needs mending. And then there is the status of the ship itself. One might have assumed that Discovery would only be rendezvousing with Enterprise, or maybe going on a joint mission. Instead, we learn that Enterprise has experienced a sudden series of ship-wide systems failures and will be towed back for a full set of diagnostics. Captain Pike (Anson Mount) takes temporary command of Discovery to investigate one of a series of seven mysterious red bursts that have appeared in the galaxy. That’s a lot of setup. But Director/Co-Creator/Executive Producer Alex Kurtzman and teleplay authors Gretchen J. Berg, Aaron Harberts (both former Executive Producers) and Co-Executive Producer Ted Sullivan manage to put all the pieces into place. As the episode ends, Captain Pike has donned a Discovery uniform, we have been properly introduced to the bridge crew for the first time, and Burnham is on a personal mission to save Spock. Looks like it’s time to book an arena tour. The group is getting together again! The fortune Pike finds on the floor of Lorca’s ready room reads, “Not every cage is a prison, nor every loss eternal.” This seems too on point to be taken literally. As you may know, the character of Christopher Pike was in the original pilot of “Star Trek.” The episode was titled “The Cage.” And it was not a prison. Then there is the loss of Dr. Hugh Culber (Wilson Cruz). Is that the loss that will not be eternal? The producers have mentioned that this season will touch on various matters, including religion. The so-called Red Angel appears to be a manifestation of this theme. 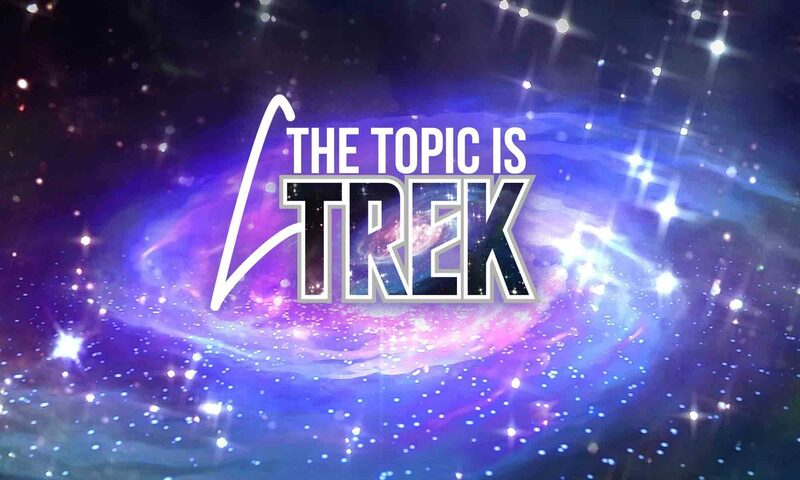 It is noted that, unlike other iterations of Trek, this episode in particular was conspicuous in its use of dialog such as “I bless you, Michael,” and “Oh, thank Christ you guys are here.” Trek has had takes on religion in the past, in fact it was a major factor on “Deep Space Nine.” It will be interesting to see how this plays out. There were a few scenes that appear to indicate all is not as it seems. For instance, Pike is genuinely confused by the way Enterprise experienced system-wide failures while attempting to investigate the red signals. Then there is the fact that, in the middle of a hectic situation, we specifically hear Pike ask Commander Jett Reno (Tig Notaro) if she knows anything about the signals. She says she knows nothing. I doubt that is true.